Head-Propping Pillow For Chronic Gamers | OhGizmo! Your spine has become gelatinous from spending too much time slumped over, playing video games? Well, just prop yourself up a little with this ingeniously designed pillow. For $36 at Yahoo Japan, not using your own muscles has never been easier. Want to spend this whole holiday period gaming and not having a backache at the end of it? 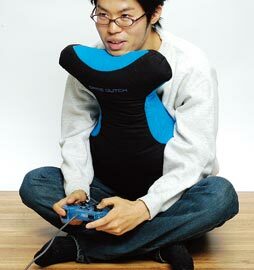 Try this Head-Propping Pillow available at Yahoo Japan. o.o I dunt Understand wut its change in game play ? !